فرودگاه بین‌المللی ایلوئیلو (به انگلیسی: Iloilo International Airport) (به زبان بومی: Paliparang Pandaigdig ng Iloilo) یک فرودگاه همگانی مسافربری با کد یاتا ILO است که یک باند فرود آسفالت دارد و طول باند آن ۲۵۰۰ متر است. این فرودگاه در کشور فیلیپین قرار دارد و در ارتفاع ۵۱ متری از سطح دریا واقع شده‌است. 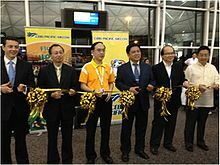 Officials inaugurate the inaugural flight of سبو پسیفیک between Hong Kong and Iloilo at the هنگ کنگ on ۹ نوامبر ۲۰۱۲. In 2011, Iloilo International Airport serviced an average of 42 flights daily on four domestic routes. At the time of its opening, the ATO believed that international flights out of and to the airport might not begin until 2008, although international passenger flights could commence once Iloilo International Airport meets ایکائو standards. A study was conducted on the feasibility of the airport serving international flights, and the CAAP announced that year that the airport met ICAO standards, allowing for international flights to land at the airport. The DOTC plans to stage international cargo flights out of the airport, as sixty percent of Philippine خوراک دریایی exports come from Panay. Japan and Hong Kong have been cited as potential first destinations of these cargo flights. On ۳۱ ژانویه ۲۰۰۸, the Iloilo city government announced that Cebu Pacific was considering starting international services from Iloilo, initially with a route to Hong Kong to cater to the large number of Overseas Filipinos there. Philippine Airlines later announced its intent to serve this route as well, suggesting that Iloilo tourism authorities mount thrice-weekly charter flights to the city using PAL خانواده ایرباس ای۳۲۰ aircraft. City government officials also believed that the opening of a کاتای پاسیفیک office in Iloilo City may bode well for future service to Hong Kong. In addition to Hong Kong flights, the Center for Research and Communication of the University of Asia and the Pacific has called for flights from Iloilo City to Japan, South Korea and سرزمین اصلی چین. The first international flight from Iloilo International Airport departed on ۸ نوامبر ۲۰۱۲, to هنگ کنگ. PAL Express, a subsidiary of Philippine Airlines, once considered a direct route from Iloilo to Malay to boost Boracay-bound tourism traffic. A resolution passed by the Iloilo City Local Development Council (ICLDC) called on PAL president Jaime Bautista to institute direct flights to Malay from Iloilo, with onward service to Cebu City on the return portion from Malay. However, PAL has questioned the route's feasibility, citing congestion at گدفریدو پی راموس which serves that municipality. Nearly ten years after initial service was discussed, on ۲۰ مارس ۲۰۱۷ leisure carrier Air Juan became the first airline to launch scheduled service between the two airports, as well as launching additional service to کویو، پالاوان in Palawan, and supplementary service to Sipalay in Negros Occidental. ↑ ۲٫۰ ۲٫۱ Ladigohon, Kenneth (۸ آوریل ۲۰۱۱). "Iloilo Airport ready for international flights". ABS-CBN News and Current Affairs. Retrieved ۸ آوریل ۲۰۱۱. ↑ Balnig, Jay Dooma (۷ ژوئن ۲۰۰۷). "No int'l flights in new airport this year: air transpo exec". Sun.Star Iloilo. Sun.Star Publishing, Inc. Archived from the original on ۱۱ سپتامبر ۲۰۰۷. Retrieved ۷ ژوئن ۲۰۰۷. ↑ ۴٫۰ ۴٫۱ Angelo, Francis Allan L. (۱۴ ژوئن ۲۰۰۷). "Int'l flights possible in NIA". The Daily Guardian. Kayo and Partners. Archived from the original on ۲۸ سپتامبر ۲۰۰۷. Retrieved ۱۴ ژوئن ۲۰۰۷. ↑ Calubiran, Maricar M. (۱۶ سپتامبر ۲۰۰۸). "International flights at Iloilo airport mulled". The News Today. TNT Publishing, Inc. Retrieved ۲۸ نوامبر ۲۰۰۸. ↑ Calubiran, Maricar M. (۱ فوریه ۲۰۰۸). "Airline company plans to have Iloilo-HK flight". The News Today. TNT Publishing, Inc. Retrieved ۱۷ فوریه ۲۰۰۸. ↑ ۷٫۰ ۷٫۱ Villalon, Kathy M. (۲۳ مه ۲۰۰۸). "Iloilo-Caticlan, Iloilo-Hongkong routes mulled". The News Today. TNT Publishing, Inc. Retrieved ۲۶ مه ۲۰۰۸. ↑ ۸٫۰ ۸٫۱ Fernandez, Jeehan V. (۱۷ سپتامبر ۲۰۰۸). "More domestic, int'l flights eyed". The Daily Guardian. Kayo and Partners. Archived from the original on ۲۵ سپتامبر ۲۰۰۸. Retrieved ۲۸ سپتامبر ۲۰۰۸. ↑ Fernandez, Jeehan V. (۱۰ فوریه ۲۰۰۸). "'Iloilo should woo int'l airlines'". The Daily Guardian. Kayo and Partners. Archived from the original on ۱۸ فوریه ۲۰۰۹. Retrieved ۲۶ مارس ۲۰۰۸. ↑ Lena, Perla G. (۹ نوامبر ۲۰۱۲). "First maiden international flight takes off from Iloilo airport". TV5 News and Information. Retrieved ۴ اوت ۲۰۱۵. ↑ Fernandez, Jeehan V. (۲۳ مه ۲۰۰۸). "PAL sees tourism, biz boom in Iloilo". The Daily Guardian. Kayo and Partners. Archived from the original on ۱۸ فوریه ۲۰۰۹. Retrieved ۲۸ مه ۲۰۰۸. ↑ "Air Juan opens flights between Cuyo, Iloilo and Caticlan". Sun.Star Manila. Sun.Star Publishing, Inc. ۱۷ مارس ۲۰۱۷. Retrieved ۲۱ مارس ۲۰۱۷. ↑ "Air Juan to start flights in Sipalay on August 3". Sun.Star Bacolod. Sun.Star Publishing, Inc. ۲۰ ژوئیه ۲۰۱۷. Retrieved ۲۷ ژوئیه ۲۰۱۷. این صفحه آخرین‌بار در ‏۱۵ ژوئیهٔ ۲۰۱۸ ساعت ‏۱۷:۱۲ ویرایش شده‌است.